I place the boxes on cleared ground. We cut and roll up our turf, but many gardeners do not think it is necessary. The added 6 inches of soil will bury most of the grass and weeds beneath. After I situate the boxes (four or five grouped together makes a good sized garden), I put down three layers of newspaper to suppress errant weed or grass seeds that might sprout. Paper degrades fully within weeks and feeds the soil. 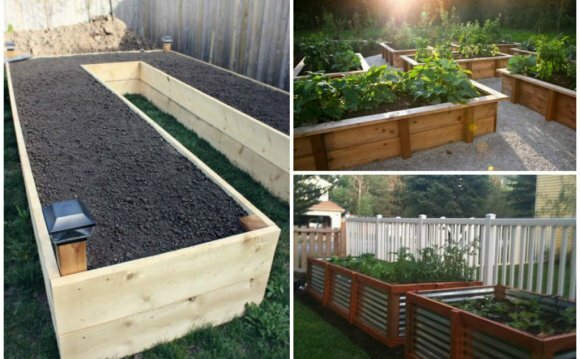 Another fast, cheap method of building raised beds is to use concrete construction blocks. They have a big bonus. Their holes can be filled with soil mix and planted with herbs or strawberries. The extra gathered heat from concrete is perfect for Mediterranean-type herbs such as rosemary and lavender. Strawberry plants grow huge and fruit fast in the holes. Each block is 16 inches long by 8 inches high; I purchase mine at big box stores as find the price most reasonable. Beds of 13 feet or longer by 4 feet wide are cheaper to build using blocks than with cedar boards. Grouping together several raised beds makes a substantial vegetable garden that is easy to maintain, with no weeding and crops that mature fast. You will be planting seeds and transplants close, because the beds are smaller and the soil is richer. But plants grown close together in raised beds mature faster, because they compete for nutrients and sunlight. Each plant senses the distance of others and adjusts its metabolism to compete. Several university studies have proven this competition syndrome by identifying how plants perceive others nearby using the green light spectrum. This 4 x 4-foot bed is crowded with productive peppers, cucumbers, a tomato plant and insect-repelling flowers that are edible.